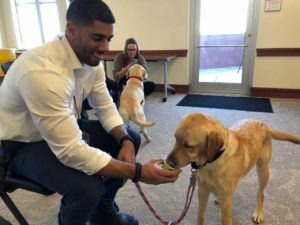 A friend told Ryan Holland about Warrior Canine Connection’s new program at the Marcus Institute for Brain Health last year. A dog lover and Army Veteran, Ryan didn’t think twice about getting involved. Ryan became a puppy parent to service dog in training, yellow Labrador Retriever Joseph. The two hit it off immediately, along with Ryan’s chocolate Lab, Jackson. Best of all, Ryan works on the Anschutz Medical Campus, where he serves as the Director of Pre-Award Contracting Services for the University of Colorado, so he’s within just a stone’s throw of regular puppy parent training sessions and other WCC-related needs.